(1) Lower Costs: New England should lower its energy costs to become competitive with other areas of the country. (2) Increase Efficiency and Renewables: New England should accelerate its efforts on energy efficiency and use more renewable energy (e.g., solar, wind) for economic and environmental reasons, but also understand their limitations. (3) Eliminate Coal and Oil: New England should complete the retirement of its “at-risk” coal- and oil-fired electric generators, which will range in age from 42 to 68 years old by 2020, and are grossly inefficient, expensive, and harmful to human health and the environment. If you accept these goals, the challenge of the current energy crisis is attaining them while maintaining an electric grid that can reliably supply power throughout the region. The reality is, to make significant progress on any or all of these goals, New England must increase natural gas pipeline capacity into the region. 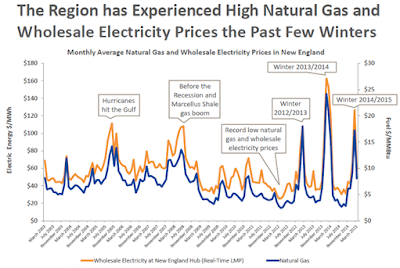 The following two charts from ISO New England, the independent regional grid operator, demonstrate how the highest natural gas prices in the U.S. lead to the highest electricity prices for New England. New England’s high energy prices equate to a multi-billion dollar annual “energy tax” on all New England consumers. Actually, high energy prices are worse than high taxes, because your tax burden increases when you make more income, a phenomenon most would welcome. In New England, high energy costs are imposed on all consumers regardless of their income and therefore disproportionately burden low-income families. While some consumers can conserve, they cannot simply forego electricity or heat. While other regions of the country tap their plentiful natural resources for energy, New England has never had indigenous natural resources capable of providing energy on-demand. However, with the Marcellus Shale at New England’s doorstep, New England should take advantage of its new geographic circumstance and construct additional natural gas pipeline capacity. The continuing energy crisis was New England’s reality despite the occurrence of a series of fortuitous events outside of New England’s control. 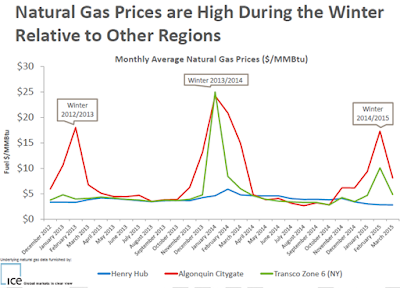 In an authoritative winter assessment, ISO attributed reliability and lower price volatility to five factors: (1) the 2014/2015 Winter Reliability Program; (2) the weather; (3) liquefied natural gas (LNG); (4) oil prices; and (5) energy efficiency. Of these five factors, only energy efficiency is a market policy within New England’s control. Let’s discuss how each of the other factors involved luck and/or is a bad bet for New England. The Winter Reliability Program is a $50 to 70 million subsidy, paid overwhelmingly for oil, that ISO deemed necessary to ensure grid reliability. All ratepayers will continue to pay this subsidy, in addition to their market costs, until ISO deems it unnecessary. This winter, through the WRP, New England’s antiquated oil-fired generators burned 2,717,500 barrels of oil compared to 2,700,500 barrels last winter. While the WRP helped avoid grid failure, it caused New England to revert to using the costly oil-fired generators that environmental groups long ago sought to displace through competition under electric restructuring. Re-reliance on oil has huge financial and environmental implications. Believe it or not, New England’s weather patterns this winter helped lower overall and peak energy consumption compared to last winter, dampening prices and reducing would-be reliance on oil and coal. This December had 15% fewer heating degree days than last. January was only slightly colder than average, but without the prolonged cold snaps we experienced in 2014. When very cold weather finally arrived in February the days were longer and we had already passed the high-demand holiday season. Frequent snowstorms caused business and school closures, further reducing electricity and heating demand. New England’s energy policy should not be based on this kind of luck. 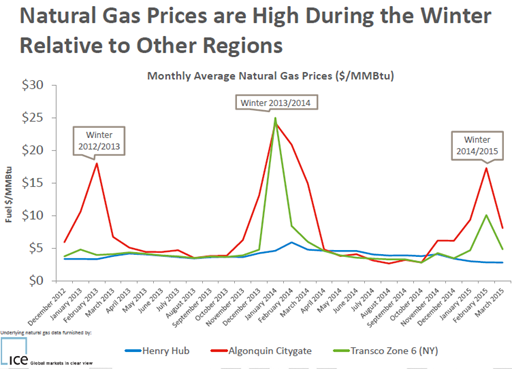 LNG was delivered to New England in semi-significant quantities for the first time since 2010, induced by a combination of some of highest electricity and natural gas prices in the world and crashing oil prices. Long-term LNG contracts are usually indexed to oil prices, and before oil prices crashed (largely because the Organization of Petroleum Exporting Countries (OPEC) maintained production despite lower global demand), LNG was being shipped overseas where it was far more valuable. There is absolutely no certainty that LNG can be a reliable resource in the future. If OPEC cuts production tomorrow, LNG prices will rise along with global oil prices. It is also worth noting that the emissions (and costs) associated with liquefying, storing, and re-gasifying natural gas are significant. 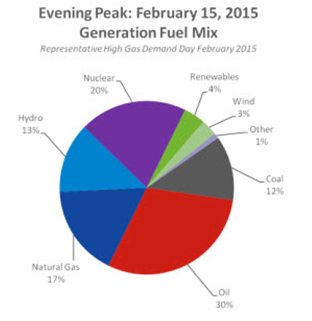 Low-priced oil capped the price of peak oil-fired generators in New England this winter, but that is not evidence that New England’s electricity market is working. The market for oil is global and is largely driven by a cartel, OPEC. The fact that we experienced the third highest electricity prices of all time, despite OPEC crashing oil prices, is very strong evidence that New England’s should plan for the worst. New England cannot sit back and hope for warm weather, low global oil prices, and LNG deliveries, while maintaining a Winter Reliability Program that is providing a lifeline to the region’s aging and inefficient oil-fired generators. New England has the opportunity to act decisively and take control of its own energy future by supporting additional natural gas pipeline capacity now—before the problem solves itself through a mass exodus of people and businesses. In my next post, I will explain the vital contribution of energy efficiency and renewables to the solution. I will also explore the limitations of energy efficiency and renewables which currently inhibit them from being the complete solution. As a parting thought, I leave you with this question: If New England substantially lowered its energy costs, could it then afford, politically and financially, to strengthen its environmental goals? Currently, it’s becoming difficult to justify current expenditures on energy efficiency and renewables on top of the highest energy costs in the country, let alone additional expenses. At an alarming rate, legislation is being introduced in state houses across New England that would reduce funding for efficiency and roll back state renewable energy goals. These bills do not appear likely to help New England: (1) lower costs; (2) increase efficiency and use of renewables; and (3) eliminate coal and oil.